Looking for an event location? Rent this wonderful space located directly off Highway 101 nestled in Mill Valley's beautiful natural scenery. Below you shall find images displaying this venue. Once you have decided to host your event at PLC Marin in Mill Valley, contact Nancy at nancy@plcmarin.org or via phone at 415-569-2104. Site Description: Panoramic, Valley, Lagoon/Pond, Creek/River, Ocean/Bay, Marsh wetlands. Description: Waltz into the beautiful city of Mill Valley where Mount Tamalpais stands proud as the city’s beautiful landmark. 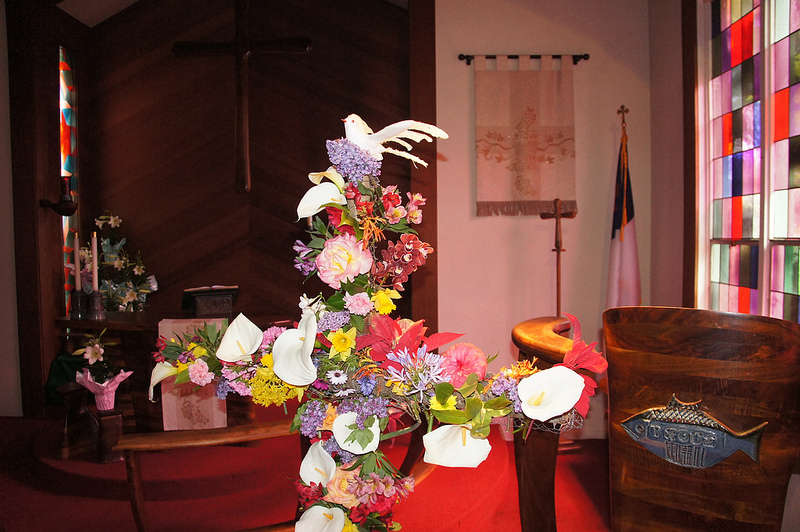 Nestled in the rolling hills and among the redwood trees, lies Peace Lutheran Church (PLC) in an atmosphere full of nature, where hikers reside and beauty remains. PLC is placed in the hidden hills of Tamalpais Valley, conveniently located near the marsh lands and perfectly positioned in mother nature overlooking the Mill Valley Wetlands. The area tends to be warm and sunny and provides an ideal wedding location as well as meeting facility for various group sizes. The location site offers various rooms, spaces and materials. The main entrance welcomes guests with a grassy hill and beautifully landscaped property. From the overhead gateway, guests are lead through a brick courtyard with fountain, swinging benches and landscaped garden. In spring, the courtyard and brick pathway lie below blossoming blue wisteria plants which droop over wooden arches for a picturesque scene. The church can serve as an ideal wedding location and includes a chapel with a bell tower, which when rung, gives the feeling of a small European town. The chapel's charming interior is perfect for ceremonies and/or receptions, with stained glass window panes illuminating the room, yet maintaining the romantic dim atmosphere in the high ceiling room. Wine colored cushioned benches make for comfortable seating and serves up to 120 seated guests. Windows line the top of each side wall, bringing in views of the ever-changing sky. Pendant chandeliers, suspended from a spectacular exposed-wood beam ceiling, cast dim lighting. The room's mood and ambiance is further enhanced by an altar and baptismal fountain. A dark wood podium stands to the side convenient for preaching, speaking or presenting announcements. The floor is carpeted as to provide for a warm homey feeling where noise is not echoed. With this peaceful and quiet atmosphere, the room serves a great resource of audio elements. Surround sound system with multiple wireless microphones serves as a great tool for presentations, announcements or ceremonies with multiple masters of ceremony. In the rear of the church, lives an extraordinary unique pipe organ for which organist services can be arranged. This unique instrument is used weekly and regular maintenance is performed to ensure perfect quality music and proper notes. Should additional instruments be desired, there is also an additional baby grand piano in the room to encourage sound from multiple locations. Connected to the chapel is a Narthex (entrance and welcome room) which is ideal for a special entrance or exit (potentially with rice or items showering the newlyweds). The Narthex is connected to a bride-getting-ready-room and also corridors to a spacious lounge area which serves as a kitchen, preparation or networking room. The room adjacent to the Narthex is "The Lounge". This area is carpeted and great for networking events or smaller seminars. The room has a permanent 60" monitor as well as a foosball table. The room leads us to the stairway towards the second floor. The second floor boasts a large room which can be used as a banquet hall comfortably seating 100 guests. Sufficient table and chairs for such a set-up are located on-site and can be included within the rental. Should outside furniture be required, or desired caterers brought on board, this can be arranged. There is a full kitchen but we recommend using this solely as a satellite kitchen. This banquet hall can also be divided into separate areas to encourage the feeling of multiple rooms. Partitions can be set up in advance. Through the kitchen is a second level of parking which can also be used for barbecuing or sporting uses. A basketball hoop is set-up as well as markers for the basketball court parameters. For children wanting to play there are two side rooms (connected to "The Lounge") which are stocked with children's toys, changing table, highchairs, etc. Adjoining the chapel is a bride's room with its own bathroom and full-length mirror, perfect for treasured moments of privacy and as a place to change before and after the wedding. Peace Hall is usually used for receptions, but it can also be staged for a wedding ceremony, or configured into four smaller meeting rooms if necessary. Floor-to-ceiling windows and doors face the courtyard, while other windows look out to the back hillside. The countertops and serving counter are perfect for buffets, and the adjacent full-size commercial kitchen—for which all appliances are supplied in order to accommodate any caterer. This beautiful facility is both romantic and spiritually uplifting. When you come by for a visit, take a moment to sit on a bench near the fountain and consider how deftly Peace Lutheran Church blends into the beautiful nature atmosphere of charming Mill Valley. CEREMONY CAPACITY: Several spaces accommodate 50-120 seated guests. Chapel Room: Seated Space for 50-120 guests. Standing for 180. The Lounge: Seated Space for up to 60 guests. Standing for 80. Lawn: Seated Space for 50. Standing for 100. MEETING CAPACITY: The Sanctuary holds up to 120 seated theater-style, or up to 180 standing guests. The Lounge holds up to 60 seated and opens onto a outdoor parking area as well as handicapped parking area. 50% of the rental fee is required to reserve your date. The rental balance and a $300-900 security deposit are due 30 days prior to the event. Rental fees range $25-2,000. The rental fee and security deposit depend on guest count, space(s) and time rented. A refundable $500 cleaning/security deposit is required to confirm a date. The facility rental fee is payable in full 30 days prior to the event. Year-round, daily, 7am-10pm; except Sunday mornings until 11am. Extended hours can be negotiated. Accommodations: no guest rooms, however, a few hotels are located within walking distance. There is ample parking available on the property as well as additional parking nearby. The venue is located right off Highway 101 and easy to access. It's located along the road to Stinson Beach, Muir Woods and the Tam Valley area.